Each summer, Red River embarks on some kind of day out to raise money for a good cause. 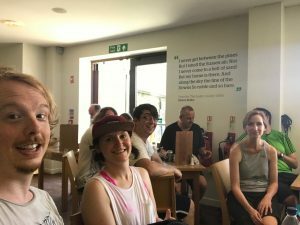 First it was the Bognor 10K run, then a 12-hour go-karting challenge, then last year we had the great idea of walking a marathon distance along the South Downs Way from Arundel to Brighton. It turned out to be 28.2 miles. 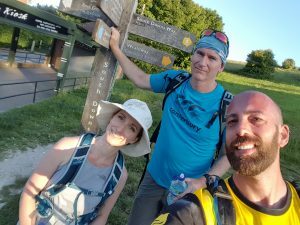 Not nearly discouraged enough, this year we decided to challenge ourselves with the easterly section of the South Downs Way: a 35-mile hike from Brighton to Eastbourne, walked in aid of Cancer Research UK. Most of the team planned to be involved, with everyone attempting different lengths. 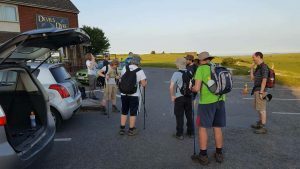 Nine of us planned to walk the whole length, and so it was that we met up at 5.45am on Sunday at Devil’s Dyke. It would be nice to say we were fresh and ready to go, but we’d all had to get up at about 4am and it was already 18°C when we arrived. We set off on the dot of 6am, planning to meet the next group at 7:30am at Ditchling Beacon. 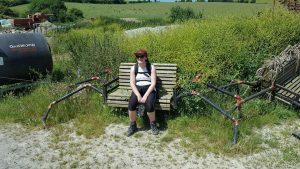 The hike started with a rolling downhill stroll to Saddlescombe Farm, but then it turned up hill pretty sharply – that was definitely a wake-up call. 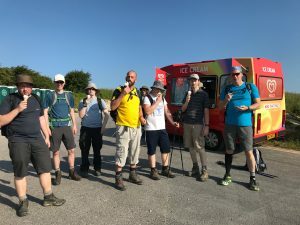 The weather was warming up already but we made OK time to the Jack and Jill windmills, and from there climbed up to Ditchling Beacon car park. We arrived a little later than planned to find that the British Heart Foundation’s London to Brighton bicycle event was happening. They had closed the roads and were preparing for 18,000 cyclists to flop exhausted over the top of the long climb before beginning the descent into Brighton. It was a bit of a double-edged sword: Matt got his car trapped there as, after he parked, the BHF closed the road until 8.20pm. On the up side there were three ice cream vans, so we got to cool down a little. It must be the earliest I’ve ever had a 99, but it was gooooood. From Ditchling to Falmer was not too bad: the section is pretty flat by the standards of the South Downs Way, and we made reasonable time. We dropped into Falmer and met the last three members of the team, taking our total number to 13. The day was really warming up, and we were beginning to suffer: we lost our first two team mates there. The remaining 11 of us set off from Falmer to climb up the south side of the A27. The hill doesn’t look that steep in the photo, but take our word for it, it was. This was one part of a very long climb back up to the top of the ridge, and was not the nicest of starts for the three that had just joined us. From there it was an eight-mile hike to Southease, where we planned to stop for lunch. By this point the heat and hills were really combining to take their toll: two more left us along the way, dropping down to a village to call for support and get a lift home. Just as you enter Southease there is a lovely old church and a drinking water tap. It made a welcome break, and at last we had a bit of shade before pushing on for a mile to get to the lunch café stop. Welcome refreshment – and finally some shade! The café at Southease was a welcome sight. We took the weight off of our feet, the bags off our backs, and had some well-earned lunch. Three more decided to call it a day there. We were 19 miles into the challenge and it was around 30°C on the hottest day of the year. 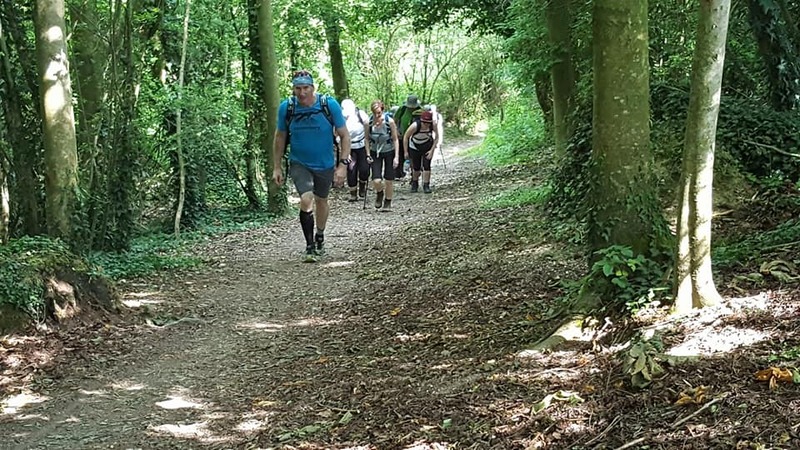 The South Downs Way follows the ridge of the hills: with precious few trees you’re very exposed, and on a hot day there’s almost no shade available. The rest at Southease was very welcome, and the climb back up on the other side was NOT! It was possibly the steepest of the day, and certainly a long, slow climb. Once at the top though we were rewarded with a good section of undulating hills. 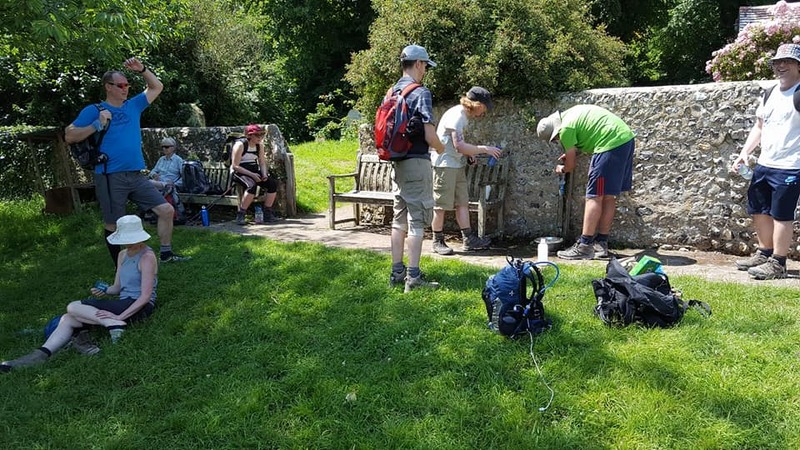 Eventually we made it to Alfriston, roughly 25 miles into the walk, and we decided to stop for the shade and refreshments of a local pub. Another couple decided that they had gone as far as they could and organised a lift back. That left four of us for the last 10 miles. By now, our conversation was definitely dwindling, as we began to simply focus on getting up the next hill or down the other side. The last few climbs of the day weren’t the steepest, but they seemed to last forever. 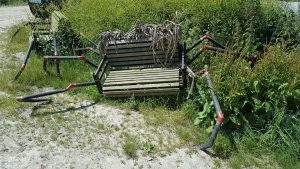 After a few more miles we reached a little village called Jevington, where another team member decided that enough was enough. He organised a taxi so he could meet us in Eastbourne. The final three set off for the last long climb and slow descent into Eastbourne. The descent was not very pleasant, we were all exhausted by this point, and going downhill seemed to hurt more than the climbs, combined with it being mostly off-camber our sore ankles, knees and hips did not like it much at all. But, eventually, we made it to the end. The sense of relief that there were no more hills and we simply had to find the pub was immense. Happy faces (sort of) at the finishing line! We had completed 33.41 miles in 11 hours and 48 minutes (excluding a one-hour lunch stop), and climbed over 3,750 feet. If you want to get a sense of how that looks, you can watch the video here. It was a long and extremely hot day topping out at 31 degrees. Everyone gave it their all and did brilliantly. Those of us who had driven to the start climbed into a taxi back to our cars. 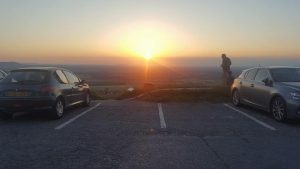 We arrived back at Devil’s Dyke to a lovely sunset, and a sore drive home. Yesterday the office was full of shuffling bodies with blistered feet, and sore knees, hips and shoulders. Aside from the sunburn there was a weird red rash that none of us have ever seen before, and at least two of the team looked like they’d just dismounted a horse. 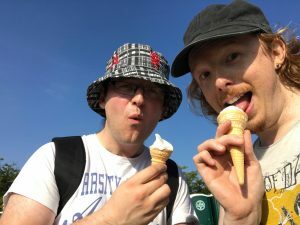 Despite all this there’s still a sense of achievement: so far we’ve raised over £1,000 for Cancer Research UK, and there’s still time to donate – we’d much appreciate it if you can. After last year’s 28-mile walk more than one person said they weren’t doing it again, and this year there might also have been the odd comment. We’ve decided that perhaps in 2018 we’ll go a little easier on ourselves, and maybe do a charity barbeque. Although, there is still a section of the South Downs Way we haven’t walked, you know.